For the first blog post of a new year, I ran across an article in Antiques & Fine Art Magazine entitled "X-Radiography Examination of an Embroidered Coat of Arms" by Angela Duckwall, about the examination of a coat of arms that was embroidered in New England in the last half of the 18th Century. The embroidery itself is based on a pattern that was common at that time (I have written about similar patterns in my work on the Gore roll of arms dating to about the same period), but the opportunity to use x-rays to examine the underlying materials without damaging the delicate work is helping us to learn a lot more about how the patterns were created, how they told the embroiderer what colors to use, and how the pieces were then worked. Despite the appearance of the arms on a lozenge ground, this it not a hatchment made for someone's funeral memorial. These embroidered patterns were often placed on a lozenge shape at that time. 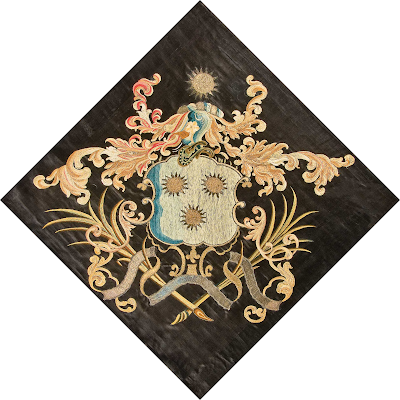 The article does not identify either the embroiderer or the armiger (the scroll underneath the shield would often have "By the Name of" and the surname, but this one does not), and a quick review of Papworth's Ordinary and Fairbairn's Crests does not come up with any likely candidates. For example, of the five names given in Papworth for the arms Azure three suns in their splendour Or (I am assuming "azure" from the blue on the shield and in the wreath), none are listed in Fairbairn as having A sun for a crest. Even without a name to go with the arms, though, it's a beautiful example of late-18th Century New England armorial work, and the use of x-radiography has given us some more insights into the process from printing a pattern to the finished piece suitable for hanging in the family parlor.